Krill oil or fish oil: which is the best source of omega-3? Krill oil or fish oil : which is the best source of omega-3? Krill oil (from tiny, cold-water crustaceans) and fish oil both provide significant amounts of omega-3 fatty acids (DHA and EPA) of comparable quality. Clinical studies show that both these sources offer positive effects against inflammation and hyperlipidaemia and are therefore invaluable for preventing cardiovascular disease. 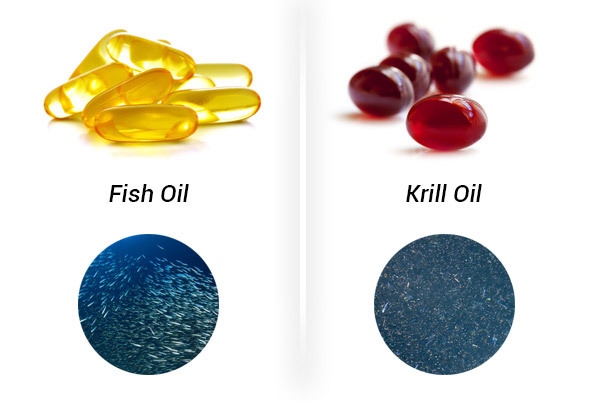 The main difference is that krill oil is generally a lot more expensive than fish oil. On the face of it, one month’s supplementation with Krill Oil 590 mg costs €9 more than a month’s supplementation with Super Omega-3, a well-known supplement produced from fish oil. However, as Super Omega-3 contains 810mg of omega-3 (EA+DHA) per dose compared with krill oil’s 315mg, the cost of the latter is actually three times that of fish oil (€1 per gram of omega-3 for fish oil, and €3.60 per gram for krill oil). Are there any advantages to spending the extra money on krill oil? The higher cost of krill oil is not only due to the fact that it is more difficult to obtain. It also contains other valuable compounds such as phospholipids, choline (an important fatty acid that contributes to the structural integrity of neuron membranes) and astaxanthin (a powerful antioxidant carotenoid that helps combat oxidative stress). This all serves to make the omega-3 more stable and easily absorbable by the body (30%-100% more so according to studies). Whether to choose krill oil or fish oil therefore comes down to cost. Those who can spend a bit more may well be tempted by krill oil for its higher bioavailability and additional effects. Those on a tighter budget will plump for fish oil, the quality of which is generally good enough to deliver the desired effects. What effects do omega-3 have on the body? A powerful action against chronic inflammation and metabolic problems. The integration of EPA and DHA into cell membranes makes them less rigid and gives them optimal permeability. This is very important since rigidity reduces membrane exchanges and encourages chronic inflammation. What’s more, in cases of systemic inflammation, omega-3 can be extracted from the membrane and converted into anti-inflammatory molecules. A reduced risk of cardiovascular problems (1). Circulating omega-3 fatty acids not only act on the atheromatous plaques responsible for cardiovascular problems (2) (by decreasing production of inflammatory cytokines and preventing monocytes from adhering to the vascular wall), they also help reduce blood pressure and elevated triglyceride levels (3) and control a large number of genes involved in lipid metabolism. Once incorporated into cell membranes, omega-3 improve the membranes’ flexibility, speeding up transduction and neurotransmission. They have a positive effect on neuronal extension, synapsis establishment, neuronal plasticity, maturation of neurons and their subsequent migration to target areas, playing a significant role in motor, sensory and cognitive abilities (4). Winter is the best time to start supplementing with marine-source omega-3, whether you opt for krill oil or fish oil.